It’s been a God-send. Don’t get me wrong, Bad Behavior has been a good little soldier too. But it couldn’t catch everything, and was unfortunately blocking a lot of valid traffic. 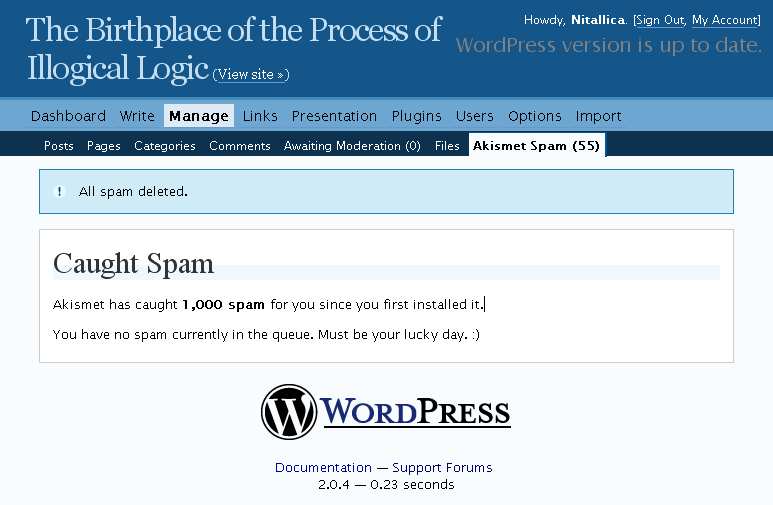 BUT, after installing Akismet, my spam comments and trackbacks went from a steady stream to nil. I did notice, however that I had received a bit of an “attack” … over the past 48 hours, there have been over 400 spam comment post attempts — I say ‘attempts’ because they had slipped through Bad Behavior, but Akismet caught ’em.